Tungsten Carbide Laser Engraved Elvish Lord of the Rings This gold colored laser engraved tungsten ring features the engraving made wildly popular in The Lord of the Rings. Was this answer helpful? 172 of 186 Customer(s) found this Answer helpful. Q: Will the yellow fade over time? Was this answer helpful? 120 of 136 Customer(s) found this Answer helpful. Q: Is this gold plated? Yes, this is Gold Plated Tungsten that will also not scratch. I hope this helps and Happy shopping! Was this answer helpful? 87 of 94 Customer(s) found this Answer helpful. Q: What does the inscription on the lord of the rings ring say? Was this answer helpful? 73 of 76 Customer(s) found this Answer helpful. 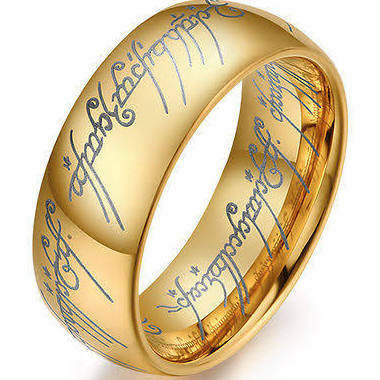 Q: This Lord of the Ring has script inside and outside, does that mean it can not be engraved? A: Correct. All the Lord of Rings we carry are not able to be engraved. Was this answer helpful? 65 of 72 Customer(s) found this Answer helpful. A: This ring will stay gold and will not tarnish or change color. Our tungsten rings are hypoallergenic and will not irritate your skin. Hope this helps! Was this answer helpful? 61 of 64 Customer(s) found this Answer helpful. That is no problem at all and there is no extra charge for this. Order this ring and in the comments at checkout, write that you want it without the Lord of Rings Design. It is that simple. I hope this helps! Was this answer helpful? 58 of 59 Customer(s) found this Answer helpful. Q: Hi Is this the name of the ringor name after the movie? A: The movie's name is: "Lord Of The Rings", the ring in the movie was called "The Ring Of Sauron". Was this answer helpful? 43 of 46 Customer(s) found this Answer helpful. Q: does this come in another color? Yes, that comes in Tungsten (Silver color), Gold (shown here) and Black. Hope this helps! Was this answer helpful? 39 of 41 Customer(s) found this Answer helpful. Was this answer helpful? 35 of 35 Customer(s) found this Answer helpful. Q: how do I change the words in/out of the ring if I want to buy this ring instead the words " Lord of the Rings "? Do you charge for that and where I would in put the new words ? 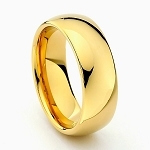 A: You can order the Classic 8mm Gold ring we sell. It is the same ring, without the Lord of the Rings. Thank you! Q: Is the gold plated or mixed with the tungsten? Was this answer helpful? 27 of 31 Customer(s) found this Answer helpful. Q: Are there any charges for exchanging rings if the one I order does not fit? Was this answer helpful? 20 of 28 Customer(s) found this Answer helpful. Q: does this ring come with writing in side? Q: Is this real Gold, how many karats? Yes, is real 18K gold plated. Q: What purity (karat) is the gold plating? Was this answer helpful? 12 of 19 Customer(s) found this Answer helpful. Q: I tend to forget to take jewelry off before taking showers or washing my hands. Will it hold up to the constant abuse I will most likely put it through? Was this answer helpful? 11 of 65 Customer(s) found this Answer helpful. This ring came just as advertised. The laser engraving of the elvish language onto the ring is excellent. You can see the script anyway you turn the ring. There is engraving on the outer and inner sides of the rings. Mine makes an excellent wedding ring, which is what mine is used for. It is very durable. That feature has been tested many times. The script and the ring are intact. It is a wonderful ring. The ring fits well and is sharp looking. Shipping was fast and it was wall packaged for shipment. A beautiful ring. It fits very well, and has a nice weight to it. Very satisfied. I would like to write a great review of this product. I can't say enough about this ring. I have been a fan of the Lord of the Rings films for many years and when I saw this ring I knew I needed to have one. This is a Beautiful Ring and even though I had to resize it twice the customer service person was excellent. Always answered my questions and my ring was delivered when they said it would be. I'm very happy with this ring. The size was perfect. Very durable which is what I needed due to type of work I do. I am extremely happy with the overall experience from the ordering process, the shipping time, and the quality of the ring itself. I love this ring - it fits great and it is beautiful. The inscriptions are a little difficult to see; but everyone I show it to knows the reference and want my precious! Fits great and the finish is tough and has not scratched even though it was subjected to sand and grit. I am more than 100% satisfied and now my wife wants one of her very own. Ring was a perfect fit, seeing that I used the Paper cut out ring sizer. Ring looks great, I am going to order the Black one as well to match certain watches I wear. This ring is awesome, I have two rings already, the first ring that I bought was too small so instead of exchanging it, I kept as a decoration. The second ring I finally got it the right size. I plan to get one for my brother and father for the holidays, I just have to find out their ring size first. This ring can be used as a piece of jewelry, or a wedding band. That's why I like this ring so much because it has two values. My wife is a ring fiend and this ring is now one of her favorites. Mucho points for me. Thanks. Great ring. Made me invisible so I could escape from that creepy little guy in the goblin tunnels. Also handy for avoiding unwanted visitors. I'm going to be honest and blunt-- 1. Great Pricing 2. Competitive Selections and 3. Awesome Business practices! I've ordered more than three rings from this particular business and never had any disappointments. With free shipping included, I can't really say more of a positive experience! Great ring with an unbeatable price! Looks awesome, details are very nicely done. Fast and free shipping. Must have for a true LOTR fan! Love the ring, size is as ordered. The only thing that is a bit disappointing is that the runes aren't as visible as in the image, but htis is a minor point. As usual with Tungsten fashions, the ring is very nice. The shipping was quick, and the price is awesome! I love my ring. It fits perfectly. I would recommend it. Love your web site.